When Mark Zuckerberg testified in front of members of Congress last month, he made many of them look like out-of-touch idiots. But he may not be so lucky today. The Facebook CEO will be testifying in front of a European Parliament committee, and they’re expected to actually ask him some tough questions. The hearing in Brussels today starts at 12pm ET, 9am PT and can be viewed live on the European Parliament website. Gizmodo also has a livestream on Facebook. 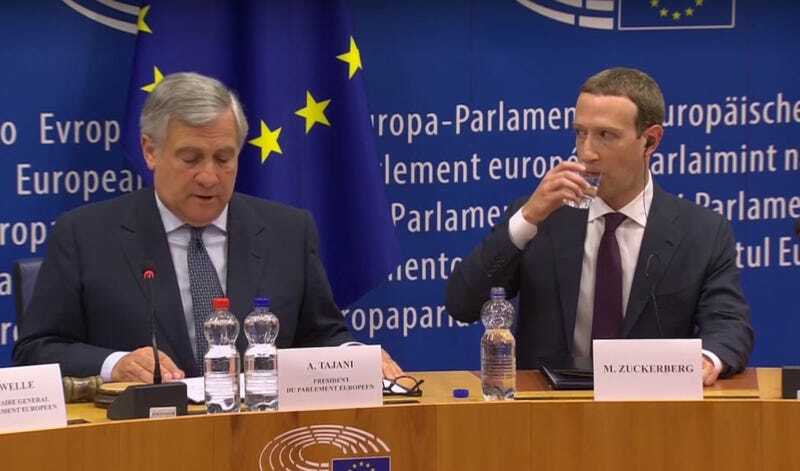 Zuckerberg’s hearing was originally scheduled to be behind closed doors, but Antonio Tajani, President of the European Union, announced just yesterday that Zuck had agreed to the entire thing being livestreamed. “I have personally discussed with Facebook CEO Mr Zuckerberg the possibilty [sic] of webstreaming meeting with him. I am glad to announce that he has accepted this new request. Great news for EU citizens. I thank him for the respect shown towards EP,” tweeted Tajani. Reuters TV will also be streaming Zuck’s testimony on its website, as well as on devices like the iPad, Apple TV, Fire TV, and Roku. You can watch Reuters TV on iOS and Android. One of Zuckerberg’s favorite answers to questions from competent US senators and representatives was, “I’ll have my team follow up with you.” We’ll have to see how many times he’s allowed to get away with that this time now that Zuck isn’t on his home turf.